... of the microbial kind. I love social media not just for the ways it allows me to stay in contact with friends and family, but the communities that have developed as well. From specialist communities selling plants to others like ‘A Wilder Child’. A group dedicated to those who are more nature-connected and wanting to encourage outdoor play and exploration (Facebook: A Wilder Child). No points for guessing then that I follow the group. However, a post in February 2019 piqued my interest. 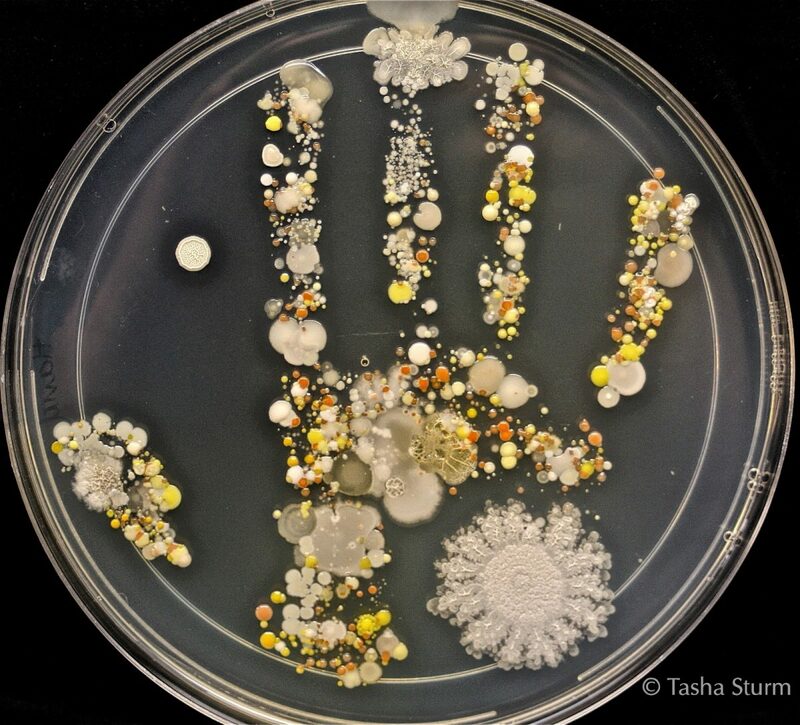 It was the above image of the microbial handprint of Tasha Sturm’s own 8-year-old child after he had been playing outside. (Sturm, T. (2017)). Yes, it’s a real image. Apart from being a beautiful image of the microbial flora that can be found on a hand which Tasha describes mostly as being normal body flora with some common bacterial/fungal contamination (Bacillus species, with the coloured bacteria possibly Staphylococcus epidermidis (white), Staphylococcu aures (yellow), Micrococcus luteus (yellow), Rhodotorula (orange) and an unknown yeast (yellow)). It was also the differing reactions I noted to the image and from which groups. While parents on ‘A wilder child’ were generally cool about it and going wow over the image, some parents on different forums were less ecstatic and rather grossed out about the idea of this sort of stuff being found on their child’s hand especially from playing outdoors. It is more than just a fascinating image. It’s a reminder that we are surrounded by a plethora of microbes and many are necessary/beneficial to us. We shouldn’t stop children playing outside, in fact stopping them and having a clean environment can be harmful. Exposure to microbes is necessary for a healthy immune system. (Timmins, B. (2017) ; Umetsu, D.T. (2012)). Not only that but there’s so much more to be learnt and gained through being able to play and explore outdoors. With grateful thanks to Tasha Sturm for use of her image.